Objective: To investigate the effect of administration of Passiflora glandulosa (P. glandulosa) fruit rinds flour on streptozotocin (STZ)-induced diabetic mice. Methods: The preliminary phytochemical screening and parameters such as centesimal composition and brine shrimp toxicity were evaluated. For in vivo study Swiss female mice were divided into four groups: NC-normal control; DC-diabetic control animals receiving saline; MET-diabetic animals receiving metformin (200 mg/kg); PFRF-diabetic animals receiving P. glandulosa fruit rinds flour (200 mg/kg). All of them were treated for 28 d. STZ was used in a single dose of 120 mg/kg to establish diabetic models. Body weight, water and food intake, fasting blood glucose were measured. Histopathological analysis of pancreas and liver were performed to evaluate STZ-induced tissue injuries. Results: Phytochemical screening showed the presence of flavanones and triterpenoids. The P. glandulosa fruit rinds flour was non-toxic by the brine shrimp test. The fruit rinds flour also reduced the loss of body weight and significantly decreased food intake in the diabetic mice. Additionally, a significant reduction in blood glucose was observed for 15 d and this was maintained on 21 d and 28 d when compared with diabetic mice. Furthermore, the P. glandulosa fruit rinds flour has a favourable effect on the histopathological changes of the pancreas in STZ induced diabetes. Conclusions: It is concluded that P. glandulosa fruit rinds flour is a natural product that contains potent antioxidant compounds and presents good prospects for the improvement of diabetic mellitus by reducing serum glucose levels. Foundation project: This study was sfinacially upported by GBtech (GreenBean Biotecnologia). The metabolic profile of type 2 diabetes mellitus is characterized by impaired glucose metabolism and insulin resistance, frequently combined with dyslipidemia. It is associated with chronic complications of hyperglycemia including nephropathy, angiopathy, retinopathy and peripheral neuropathy, which remain major problems in diabetic care and cause a lack of work aptitude, disability and premature death. Currently, it is estimated that the world population with diabetes is 415 million, having predicted to reach 642 million by the year 2040. According to the International Diabetes Federation (IDF), Brazil ranks fourth among the countries with the largest number of people with diabetes, being 14 million in 2015. Diabetes growth is one of the great concern that the prevalence of risk factors for chronic disease is on the increase in developing countries. Although considerable progress has been made in the treatment of diabetes mellitus by oral hypoglycemic agents, people are still searching for newer drugs endures because the current synthetic drugs have several limitations and side effects. In the past decades, traditional systems of medicine and research on medicinal plants have become greater interest and importance. Because of their better effectiveness, relatively low cost and fewer side effects, medicinal plants are prescribed widely. Yellow passion fruit [Passiflora edulis Sims f. flavicarpa (P. edulis)], which is native to Brazil, is one of the best- known tropical fruits suited for processing throughout the world. During the last two decades, Brazil has developed as the world’s largest manufacture of passion fruit, representing almost 60% of the global production. This exotic fruit, rich in vitamins A and C, carotenoids and polyphenols, has also been used in pharmaceutical preparations and widely employed as a flavouring and as juice in food industries. Passion fruit byproducts constitutes 50% of the whole fruit which has a high potential, primarily because it is rich in bioactive compounds with a high antioxidant capacity and dietary fiber content. The use of mesocarp of passion fruit is an important dietary supplement for the treatment of diabetes mellitus due to its potential hypoglycemic effect, and its ability to reduce triacyl glycerides and cholesterol levels. The investigation of biological activities is critical to recovery and valorization of by-product that may induce considerable environmental, economic and therapeutic effects. Sousa et al. reported the fresh peel of Passiflora glandulosa (P. glandulosa) containing pectin showed promising anti-diabetic activity in alloxan-induced diabetic mice. According to the literature reviewed, no reports are available on the hypoglycemic effect of P. glandulosa fruit rinds flour; in this respect, it is imperative to generate information related in this field since this natural fruit represents a potential origin for the resumption of polyphenolic compounds with high added value. Therefore, the objective of the present investigation was to screen the hypoglycemic activity of P. glandulosa fruit rinds flour against streptozotocin (STZ)-induced diabetes in mice. STZ was supplied by Sigma, Co. (St Louis, MO, USA). Metformin hydrochloride was purchased from Medley Pharmaceutical, Co. (Campinas, Brazil). The biochemical kit was purchased from commercial kit Bioclin® (Belo Horizonte, Brazil). All other reagents of analytical grade were purchased locally. The fruit of P. glandulosa Cav. was collected from Chapada do Araripe Region in Ceará, Brazil. The identification of the botanical species was performed by Herbarium Dárdano de Andrade Lima of the Regional University of Cariri-URCA and deposited under Number 9983. The passion fruits were washed and sanitized. The flavedo and pulp were removed and the rinds were cut into small pieces, bleached for enzymatic inactivation and dried in a forced circulation oven at 45 °C until constant weight. The dried rinds were crushed until obtaining a fine flour, denominated P. glandulosa fruit rinds flour that was used like raw material for all the tests. This flour was packed in polyethylene vacuum bags and stored in a freezer (−18 ± 2) °C. The flour (200 mg/kg) was dissolved in distilled water for preparing the solution. Dosages were administered by gavage for 28 d at the morning time. The preliminary phytochemical analysis was performed on the P. glandulosa fruit rinds flour, qualitative tests was carried out to characterize secondary metabolites, such as phenols, tannins, flavones, flavonols and xanthones, steroids and triterpenoids, etc. according to Brazilian Pharmacopoeia. The chemical characterization of the flour was analyzed by performing some techniques, for example, moisture content was quantified in the dried samples by drying in the oven 100 °C-105 °C for 3 h in accordance with Lutz. The ash content was determined in the dried samples using the official methodology described by the Association of Official Agricultural Chemists (AOAC). The content of total soluble protein was analyzed according to the method described by Bradford. The total carbohydrate was performed by the phenol-sulfuric method determined according to the methodology described by Dubois et al.. Finally, the determination of the total lipids of the flour was carried out according to the procedure described by Triebold. The lethality assay with Artemia salina (A. salina) microcrustacean was used to evaluate the toxicity of flour (P. glandulosa) using LC50 (median lethal concentration) as the parameter of the biological activity. Subsequently, PFRF solutions of different concentrations (10, 100 and 1 000 μg/mL) were prepared and dissolved in DMSO (3%). The same vehicle was used as a negative control. 100 mL volumes of each concentration were added to 2.9 mL of saline water containing artemias (n = 10) in triplicate for 24 hours. After this period, the dead artemias count was performed. The data were processed using statistical analysis and the LC50 obtained by data donate counting living and dead larvae estimated by probit analysis method according to confidence interval 95% trimmed Spearman-Karber using software (version 1.5). The LC50 (95% CI) was >1 000 μg/mL. Female Mus musculus mice aged 8 to 12 weeks, weighing between 25-30 g, were used in these experiments. All animals were housed in polyacrylic cages at room temperature (22±2) °C and constant humidity (40%-70%) under a 12 h light-dark cycle. All animals were fed with rat pellet and provided with tap water ad libitium. The experimental procedure performed on animals was in accordance with the policy of the Institutional Animal Ethical Committee of (CEUA), the State University of Ceará (UECE) (No. 7043255/2014). The animals of the control groups (normal control and diabetic control) were fed in a standard diet (MP-77, primor, São Paulo) which consists of commercial ration for laboratory animals mice, guinea pigs and hamsters, and so forth, composition of (g/100 diet) protein 23 g, total fat 4.0, and total fiber 5.0 and other vitamin contents. The entire experimental procedure was conducted according to the regulations of Brazilian legislation on the animal sciences (Law No. 11794 of October 8, 2008). The animals were allowed to adjust to the laboratory environment for two weeks and then induced diabetes. Diabetes was induced by intraperitoneal injection (i.p.) of STZ dissolved in 0.01 M citrate buffer (pH 4.5) at a dose of 120 mg/kg body weight. Diabetes was confirmed by determining the blood glucose level of fasted (with blood glucose > 200 mg/dL) 7 d after STZ administration. Animals were divided into four groups (n=7) as mentioned below: healthy animals treated with 0.1 mL of the saline/day/animal (normal control group); diabetic control animals treated with 0.1 mL of saline/day/animal (diabetic control group); diabetic animals treated with metformin (200 mg/kg) dissolved in distilled water (metformin group) and diabetic animals treated with a P. glandulosa fruit rinds flour at 200 mg/kg dissolved in distilled water (PFRF group). Blood samples were collected via ocular sinus of mice on day 0, 7, 15, 21 and 28 to determine the glucose concentration. Evaluation of the biochemical parameter was employed, commercial kit Bioclin® (Belo Horizonte, Brazil). Food intake, body weight and water of animals were measured once a week. Towards the end of the experimentation, all the mice of various groups were sacrificed utilizing mild anaesthesia. The liver and pancreas tissues samples collected were fixed in 10% neutral formalin solution for 48 h, dehydrated by passing through alcohol implanted in paraffin blocks. Sections of 5 mm thickness were cut and stained with hematoxylin-eosin (HE). These specimens were observed under light microscopy (Nikon YS2) with 40 magnification. The data are expressed as means±standard error of mean (SEM). To analyze the significance of the differences between the animal groups, it is realized by the Variance (ANOVA) followed by Newman-Keuls test. The significance level for all analyses was P<0.05. Statistical procedures were performed in the statistical program GraphPad Prism version 6.0 for application testing. The phytochemical screening analysis of P. glandulosa fruit rinds flour was investigated and showed the presence of flavonones and triterpenoids in the fruit rinds flour. The physicochemical characterization of P. glandulosa fruit rinds flour showed the moisture percentage and ash content of 13.9% and 4.8%, respectively. For macronutrients, the values were 1.1%, 1.8% and 78.4% for total proteins, lipids and carbohydrates, respectively. The cytotoxic activity of P. glandulosa fruit rinds flour was explored with a brine shrimp lethality bioassay. In this study, the P. glandulosa fruit rinds flour showed that the LC50 value was greater than 1 000 μg/mL, which was considered non-toxic compounds. There is a general agreement in Meyer’s toxicity index that LC50 greater than 1 000 μg/mL is considered non-toxic, while LC50 less than 1 000 μg/mL is considered to be toxic. Thus, the substantial lethality of the P. glandulosa fruit rinds flour indicates the presence of potent non-cytotoxic compounds. Effect of P. glandulosa fruit flour on blood glucose levels in the diabetic mice induced by STZ was shown in [Table 1]. The induction significantly increased blood glucose levels in diabetic control group compared to normal control group. Treatment of STZ-induced diabetic rats with metformin (200 mg/kg) produced a significant (P<0.05) decrease in serum glucose levels on day 15 d and 28, respectively compared to the diabetic control group. Treatment with P. glandulosa fruit rinds flour at a dose of 200 mg/kg produced a significant decrease (P<0.05) in serum glucose levels of diabetic animals on day 15, 21 and 28 comparing with the diabetic control group. In this way, P. glandulosa fruit rinds flour displayed a marked anti-hyperglycemic activity in STZ-induced-diabetic mice by reducing the blood glucose levels. Table 1: Effect of P. glandulosa fruit flour in plasma glucose concentrations of diabetic mice assayed at different time intervals (mmol/L). Effect of P. glandulosa fruit flour on body weight in the diabetic mice induced by STZ was shown in [Table 2]. There was no significant difference in body weight between groups prior to induction of diabetes with STZ administration. Body weight decreased in the diabetic control group, metformin and PFRF groups after treatment. The decrease was significant (P<0.05) after 28 d of treatment in the diabetic control group, while no significant changes in body weight was observed in metformingroups and PFRF group after treatment. The diabetic control group presented a significant increase (P<0.05) in water intake and feed in relation to the normal control group, respectively. The PFRF group showed similar results of food and water consumption with the group that received metformin, that is reduced (P<0.05) feed intake, but promote an increase in water consumption compared to the diabetic control group [Table 2]. Table 2: Effect of P. glandulosa fruit flour on body weight, feed intake and water of diabetic mice induced by STZ. The analysis of histopathological tests performed in the pancreas and liver of diabetic animals treated for 28 d with P. glandulosa rinds flour were shown in [Figure 1]. The pancreas structure of the normal control group showed no architectural changes. The pancreas of the normal control group [Figure 1]A presented normal islets, whereas the mice of the diabetic control group presented a slight decrease in the size of the islets with cellular degeneration [Figure 1]B. Administration of metformin treatment [Figure 1]C greatly reduced the size of islets with evident cellular degeneration when compared to that of diabetic animals and normal control groups. Although the size of the islets of Langerhans was significantly reduced in the PFRF-treated groups [Figure 1]D; these changes were proportionally smaller when compared to the metformin group. Figure 1: Histopathology of the pancreas and liver of diabetic mice treated with P. glandulosa fruit flour. Pancreas (A-D) and liver (E-H). A, E: Normal control group; B, F: Diabetic control group; C, G: Metformin group; D, H: PFRF group. Yellow arrow: hydropic degeneration; Yellow arrow head: malignant hepatocytes, severe anisocytosis, bulky cytoplasm, nuclei irregular shape and grossly distributed chromatin with evident nucleoli (irregular and sometimes macronuclei). 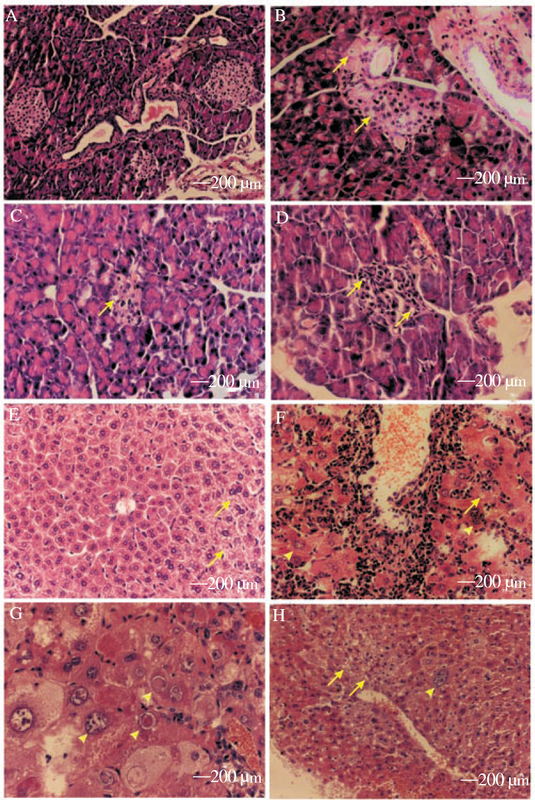 As for liver tissues [Figure 1], there were no appreciable histological changes observed in animals of the normal control group [Figure 1]E, however, some animals in the group showed hydropic degeneration. There were also discrete inflammatory foci consisting of lymphocytes and plasma cells. However, those of diabetic control group [Figure 1]F, metformin group [Figure 1]G and PFRF group [Figure 1]H mice were neoplasia that reproduced malignant hepatocytes of severe anisocytosis, with massive cytoplasm and nucleus of irregular contours, grossly distributed chromatin with evident nuclei (irregular and sometimes macronuclei). There were also binucleation, the presence of atypical mitoses and multiple foci of apoptosis. Bile duct hyperplasia was also observed. The remaining liver tissue was sparse and thirsty for hydropic degeneration. Preliminary phytochemical analysis of P. glandulosa fruit rinds flour revealed the presence of phytochemicals and established possess the class of secondary metabolites. In particular, flavanones and triterpenoids are reported to be the major phytoconstituents of this flour. Since these phytoconstituents implies they originate from the secondary metabolism of plants, they almost always act in plant protection against pathogens and may in this manner have fascinating biological activities. The results presented in this study are considered important, as well as indicated by Dornas et al., flavonoids and triterpenoids are special metabolites which also exhibit anti-diabetic potential, act by increasing insulin release by modifying the glucose metabolism in hepatocytes, hyperglycemic inhibiting factors, inhibiting the synthesis of enzymes in hepatocytes. Anusooriya et al. reported the presence of flavonoid from aqueous fruit extract of Passiflora ligularis Juss, contributed to elevating the anti-diabetic activity in a STZ-induced diabetic mouse model, improving the glucose parameters. The moisture content of the P. glandulosa fruit rinds flour (13.9%) presented a lower risk of microbial growth, fell compliance with the pharmacopoeia limits of the moisture content of vegetal drugs, which is between 8.0% to 14.0%. According to the National Agency for Sanitary Surveillance (ANVISA), the highest moisture content allowed by current legislation of flour is 15.0%. Results for ash content demonstrated found (4.8%) which is relatively normal in the case of fruits, similar to that found by Lima et al., which obtained the result of 6.0% P. edulis peel flour in dry matter, the high ash content may be a problem for the application of these residues to food, since metal ions may increase the oxidation of products. Our results revealed that the protein content of the sample was approximately 1.10%. The content found was slightly higher than that reported by the flour of Passiflora nitida 1.0%. Low levels of fat content were additionally identified, 1.80% of flour. The results obtained are in agreement with the findings reported by López- Vargas et al. (1.00%) for lipid contents in P. edulis var. flavicarpa. Carbohydrates are the main constituent of the flour (78.40%), with glucose as the standard, measuring the sugars. The presented data confirm the results found by Souza et al. that found 77.07 g of total carbohydrates in the composition of the flour of the yellow maracuja (P. edulis). A large amount of carbohydrates in the P. glandulosa is justified by the presence of fibers. Preliminary phytochemical screening revealed the presence of flavanones and triterpenoids. Therefore, these compounds present non-toxic action for brine shrimp bioassay of P. glandulosa fruit rinds flour, showing possibly be safe for use in human. The method adapted to diabetes induction to evaluate the hypoglycemic effect in mice was effective since most animals induced with STZ showed blood glucose above 200 mg/dL. The diabetic effect of the STZ occurs by the destruction of pancreatic beta cells, thereby extremely reducing insulin levels. For this reason, blood glucose levels are so high and therefore very difficult to be reduced to normal levels without exogenous insulin administration. In diabetic animals, it was found that the administration of flour produced a significant hypoglycemic effect from the 15th day of treatment compared to the diabetic control group. From the results, it is suggested that flour should be responsible for stimulating the release of insulin or it’s hypoglycemic effects due to increased peripheral glucose utilization. Diabetes mellitus is a chronic disease described by high blood glucose levels due to an absolute deficiency of circulating insulin levels. This result agrees with other studies in alloxan-induced diabetic mice, in which Lima et al. showed that the fasting serum blood glucose levels of alloxan-induced diabetic rats, treated for 21 d with feed enriched with 20% and 40% flour from the mesocarp of Passiflora nitida Kunth, reduced to 38.7% and 40%, respectively. In our study, the administration of P. glandulosa fruit rinds flour to diabetic mice induced by STZ showed a significant and consistent decrease in glycemia levels over 28 d when compared to diabetic control group, indicating its potent antidiabetic activity. STZ induces diabetes through the destruction of pancreatic β cells during diabetes causes metabolic changes with decreased body weight gain and increased feed and water intake. The reduction in blood glucose reflected lower weight loss and reduced food consumption. These results complement those of Sousa et al., who extracted the pectin (600 mg/kg) from the fresh peel of (P. glandulosa) administered orally for 30 d, reduced glycemia in diabetic rats by about 27%. There was a reduction in feed intake and water consumption in this study, while body weight remained stable in animals. According to these investigators, the inhibitory action of this preparation on STZ-induced hyperglycemia can be attributed to the fact that this plant induces an increase in the concentration of plasma insulin. It is probable that the presence of fiber from P. glandulosa fruit rinds flour promoted satiety due to delayed gastric emptying; in this way, the reduction of carbohydrate intake may have improved insulin sensitivity and reduction of glycemia. However, the mechanism by which weight maintenance of diabetic animals occurs despite that low feed intake is still unknown. Goff et al. reported that a possible explanation would be the reduction of the metabolic rate of the animals that seek to compensate for the reduction of the feed intake. One of the most evident symptoms of diabetes is hyperglycemia, which is capable of producing reactive oxygen species, both in human and murine models through a pathway activation process of hexosamine. This formation of advanced glycation end product (AGEs), as well as mechanisms of the signalling activation of protein kinase C (PKC), generates oxidative stress, in addition to microvascular complications in several organs. Among the changes that cause hyperglycemia in diabetic animals are decreased differentiation capacity, as well as changes in gene expression in β cells, and decreased expression of genes involved in insulin release stimulated by increased glucose levels. Streptozotocin is a glucosamine nitrosourea derivative isolated from Streptomyces achromogenes with diabetogenic properties due to its selectivity of pancreatic β cells and also for the generation of nitric oxide, it is regularly used for the induction of diabetes in animals for the purpose of studying potential anti-diabetic substances. In our study, the induction of diabetes by STZ caused reduction of pancreatic islets by decreasing the number of β cells compared to the normal control group. Moreover, the oxidative stress produced under diabetic conditions is likely involved in the progression of pancreatic cell dysfunction found in diabetes. Due to the low levels of antioxidant enzyme expressions, the pancreatic β-cells (type 1 diabetes) produced oxidative stress and tissue damage. Therefore, β-cells get to be disintegrated regarding both insulin secretion. These symptoms are clarified in our study from the histopathology details of the pancreas of diabetic control group [Figure 1]B. However, it is worth emphasizing that P. glandulosa fruit rinds flour minimized the architectural changes in the size of islets caused by administration of STZ, and it is more effective than metformin. Possibly, the glycemic improvement found in this study is due to the presence of flavonoids in P. glandulosa fruit rinds flour, which have the capacity to regenerate damaged pancreatic β cells in diabetic animals. Among the animals that did not present neoplasia, it was seen that hydropic degeneration was ranging from mild to moderate in all groups. However, it is still necessary to consider some atypias seen in hepatocytes: giant cells of irregularly distributed chromatin and evident nucleoli. The appearance of alterations in hepatocytes can be justified by the increase of reactive oxygen species, nitric oxide production, oxidative stress and mitochondrial dysfunction caused by STZ,. The liver plays a key role in the syndrome as an integrator of the metabolic and hormonal signals that regulate glucose synthesis and their transit to peripheral tissues besides of maintaining adequate levels of glucose in the body. AMPK, a kinase activated by AMP present in the liver acts as an energy sensor, assisting in glycemic control by modulating the production of glucose by the catabolic stimuli and the production of proteins that participate in the control of gluconeogenesis. In the present study, we observed that the liver of STZ-induced diabetic mice showed the appearance of liver tumors as shown by Vinerean et al.. These changes were observed irrespective of glycemic improvement in animals treated with metformin or with PFRF. Despite the fact of the improvement of glycemic levels by PFRF and metformin treatments, the glycemia of the animals is still higher than the normal control group, therefore, diabetes hyperglycemia may have induced liver toxicity due to improved free radical production causing serious damage to the vital organs like the liver. In a study that sought to evaluate the genotoxic potential of STZ and the ability of some free radical scavengers to modulate its deleterious effect on DNA in normal human lymphocytes and HeLa cancer cells, they reported that although alkylation has been considered the main mechanism underlying genotoxicity of STZ, it was suggested that the production of free radicals by the drug be the main mode of its interaction with DNA,. Based on these data, P. glandulosa rinds flour did not reverse the deleterious effects of STZ on the liver. But in this study, P. glandulosa fruit rinds flour was administered in the short term to animals and possibly its long-term administration could have been more efficient since the pancreas changes were smaller proportionally compared to metformin. From the observed results, it can be concluded that the P. glandulosa Cav fruit rinds flour administered at a dose of 200 mg/kg for 28 d in diabetic mice is capable of exhibiting significant anti-hyperglycemic activity in STZ- induced diabetic mice. Additionally, it assists improvement in body weight and food consumption so that it might be valuable in diabetes treatment. P. glandulosa fruit produces nutraceuticals, and it may prove to be effective for the management of diabetes. The authors would like to thank the Laboratory of Biotechnology and Molecular Biology(LBBM), State University of Ceara, for providing their instrument facility. American Diabetes Association. Standards of medical care in diabetes- 2015. Diabetes Care 2015; 38(1): 1-94.
International Diabetes Federation. IDF diabetes atlas. 7th ed. Brussels:International Diabetes Federation\; 2015, p.1-4. Gerry H, Tan MD. Diabetes care in the Philippines. Ann Glob Health 2015; 81(6): 863-869. Moon MK, Hur KY, Ko SH, Park SO, Lee BW, Kim JH, et al. Combination therapy of oral hypoglycemic agents in patients with type 2 diabetes mellitus. Korean J Intern Med 2017; 32(6): 974-983. Ekor M. The growing use of herbal medicines: issues relating to adverse reactions and challenges in monitoring safety. Front Pharmacol 2014; 4: 177. Oliveira DA, Angonese M, Gomes C, Ferreira SRS. Valorization of passion fruit (Passiflora edulis sp.) by-products: Sustainable recovery and biological activities. J Supercrit Fluid 2016; 111: 55-62. Talcott ST, Percival SS, Pittet-Moore J, Celoria C. Phytochemical composition and antioxidant stability of fortified yellow passion fruit (Passiflora edulis). J Agr Food Chem 2003; 51(4): 935-941. Teixeira F, Rodrigues L, Sampaio B, Moura A, Bizzani M, Silva L. Biological properties of apple pomace, orange bagasse and passion fruit peel as alternative source of dietary fibre. Bioact Carbohydr Diet Fibre 2015; 6: 1-6. Sousa RVRB, Guedes MIF, Marques MMM, Viana DA, Silva ING da, Rodrigues PAS, et al. Hypoglycemic effect of new pectin isolated from Passiflora glandulosa Cav in alloxan-induced diabetic mice. World J Pharm Pharm Sci 2015; 4(1): 1571-1586. Brazilian Health Surveillance Agency (ANVISA). Brazilian Pharmacopoeia. 5th ed. Brazil: Brazilian Health Surveillance Agency (ANVISA); 2010. Lutz IA. Métodos físicos-quimicos para análise Aliment. 4th ed. São paulo: Instituto Adolfo Lutz; 2008, p. 589-625. AOAC. Official methods of analysis of AOAC International. Rockville: Association of Official Analysis Chemists International; 2000, p.2-66. Howard Oltas Triebold. Quantitative analysis: with applications to agricultural and food products. New York: D. van Nostrand Co.; 1946. Meyer B, Ferrigni N, Putnam J, Jacobsen L, Nichols D, McLaughlin J. Brine shrimp: A convenient general bioassay for active plant constituents. Planta Med 1982; 45(5): 31-34. Dornas WC, De Oliveira TT, Dores RGR, Fabres MHA, Nagem TJ. Efeitos antidiabeticos de plantas medicinais. Braz J Pharmacog 2009; 19(2A): 488-500. Anusooriya P, Malarvizhi D, Gopalakrishnan VK, Devaki K. Antioxidant and antidiabetic effect of aqueous fruit extract of Passiflora ligularis Juss. on streptozotocin induced diabetic rats. Int Sch Res Notices 2014; 2014: 1-11. ANVISA. Resolution RDC n.354 on establish the regulation of technical standards for wheat flour. Brazil: Brazilian Ministry of Health, National Health Surveillance Agency; 2011. Lima GC, Vuolo MM, Batista ÂG, Dragano NRV, Solon C, Maróstica Junior MR. Passiflora edulis peel intake improves insulin sensitivity, increasing incretins and hypothalamic satietogenic neuropeptide in rats on a high-fat diet. Nutrition 2016; 1: 1-31. Lima ES, Schwertz MC, Sobreira CRC, Borras MRL. Hypoglycemic effect of passion fruit (Passiflora nitida Kunth) fruit meal in normal and diabetic rats. Bras JPl Med 2012; 14(2): 383-388. López-Vargas JH, Fernández-López J, Pérez-Álvarez JA, Viuda- Martos M. Chemical, physico-chemical, technological, antibacterial and antioxidant properties of dietary fiber powder obtained from yellow passion fruit (Passiflora edulis var. flavicarpa) co-products. Food Res Int 2013; 51(2): 756-763. Souza MWS, Ferreira TBO, Vieira FR. Centesimal composition and technological functional properties of passion fruit peel flour. Alim Nutr 2008; 19(1): 33-36. Noor A, Gunasekaran S, Vijayalakshmi MA. Improvement of insulin secretion and pancreatic β-cell function in streptozotocin-induced diabetic rats treated with Aloe vera extract. Pharmacognosy Res 2017; 9(1): S99-S104. Pereira MA, Ludwig DS. Dietary fiber and body-weight regulation, observations and mechanisms. Pediatr Clin N Am 2001; 48(4): 969-980. Goff HD, Repin N, Fabek H, Khoury DE, Gidley MJ. Dietary fibre for glycaemia control: Towards a mechanistic understanding. Bioact Carbohydr Diet Fibre 2018; 14: 39-53. Kizub V, Kateryna I, Anatoly K, Soloviev I. Protein kinase C in enhanced vascular tone in diabetes mellitus. Int J Cardiol 2014; 2(15): 230-242. Brereton MF, Rohm M, Shimomura K, Holland C, Tornovsky-babeay S, Dadon D, et al. Hyperglycaemia induces metabolic dysfunction and glycogen accumulation in pancreatic β- cells. Nat Commun 2016; 7: 1-15. Chandramohan R, Pari L. Anti-inflammatory effects of tyrosol in streptozotocin-induced diabetic Wistar rats. J Funct Foods 2016; 27: 17-28. Wang J, Wang H. Oxidative stress in ancreatic beta cell regeneration. Oxid Med Cell Longev 2017; 2017: 1-9. Oh YS. Plant-derived compounds targeting pancreatic beta cells for the treatment of diabetes. Evid-Based Compl Alt 2015; 2015: 1-12. Kuo CW, Shen CJ, Tung YT, Chen HL, Chen YH, Chang WH, et al. Extracellular superoxide dismutase ameliorates streptozotocin-induced rat diabetic nephropathy via inhibiting the ROS/ERK1/2 signaling. Life Sci 2015; 135: 77-86. Forcados GE, James DB, Sallau AB, Muhammad A, Mabeta P. Oxidative stress and carcinogenesis: Potential of phytochemicals in breast cancer therapy. Nutr & Cancer 2017; 69(3): 365-374. Reccia I, Kumar J, Akladios C, Virdis F, Pai M, Habib N, et al. Nonalcoholic fatty liver disease: a sign of systemic disease. Metabolism 2017; 72: 94-108. Day EA, Ford RJ, Steinberg GR. AMPK as a therapeutic target for treating metabolic diseases. Trends Endocrinol Metab 2017; 28(8): 545-560. Blasiak J, Sikora A, Wozniak K, Drzewoski J. Genotoxicity of streptozotocin in normal and cancer cells and its modulation by free radical scavengers. Cell Biol Toxicol 2004; 20(2): 83-96.